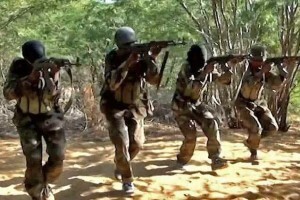 MOMBASA, Kenya (Garowe Online) — Gunmen killed two police officers guarding a church on Kenya’s southern coast on Sunday in an attack that police said bore the hallmarks of Somalia’s Islamist militant group al Shabaab. Four gunmen confronted the police stationed at the entrance of an Anglican church in the town of Ukunda, south of Mombasa, regional police chief Larry Kiyeng said. They sprayed the officers with bullets before escaping by motorbike, taking two AK-47 police rifles, he said. “One officer was shot in the head and died on the spot while the other … died in hospital,” Kiyeng told Reuters.